Help your kids identify things that begin with i. 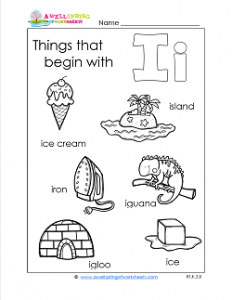 With the words ice, ice cream, igloo, iguana, island, and iron, this worksheet can help you with that. Simply have your kids look at each picture and “read” the words. They may need you help and support. Read the words with your kids being sure to note that each word starts with the same letter – the letter i. Have them circle each beginning i. Your kids can then color the pictures and the upper and lower case Ii.